It’s just over a week until the Nintendo Switch hits the shops and you get to see and touch it for yourselves. Our console has arrived just ahead of the launch date so to tide you over we’ve filmed the very moment we unboxed the console for you to enjoy. 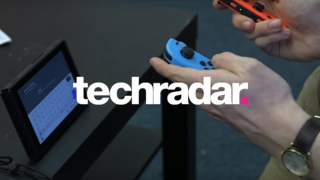 Watch below as TechRadar’s own Jon Porter opens the console for the first time and shows you exactly what you can expect to get in the box. Upon opening the box you’ll find both Joy-Con controllers side by side and individually wrapped alongside the console’s tablet. Lift away this part of the box and you’ll find the console’s manual, the (non charging) Joy-Con grip, Joy-Con wrist straps, the main dock, and HDMI cable and a charger. In short, everything you need to get started, aside from a game to play. Not sure what games you'll have to choose from? Not to worry, you can see all the Nintendo Switch games coming at launch right here. If you're yet to reserve the new console, be sure to check out the our selection of the best Nintendo Switch pre-orders.